About 1,000 Dutch Catholic churches – around two-thirds of the total in the country –will be shut by 2025, Cardinal Willem Eijk warned Pope Francis at an ad limina visit on Monday, reports The Tablet. The decline will occur as the Church reorganises its parishes under the pressure of 'drastic secularisation' and dwindling congregations and collections. 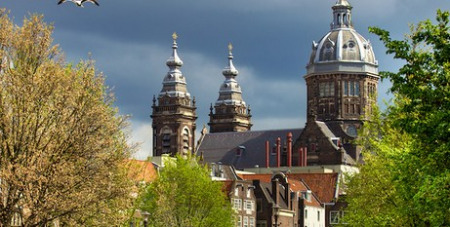 A sober report by the Netherlands bishops’ conference said the Dutch Church was a shrinking 'Church in reorganisation' that had to close many lesser-used buildings and merge parishes into larger units to deal with its diminishing resources. Last year, there were 1,593 Catholic churches in Holland, a 10 per cent decline from 2004. This trend is set to accelerate. 'We predict that a third of these Catholic churches in our country will be closed by 2020 and two-thirds by 2025,' said Cardinal Eijk, Archbishop of Utrecht and head of the bishops’ conference. The bishops delivered a report to the Vatican saying the percentage of Catholics in the Dutch population had dropped from 28.4 per cent to 24.1 per cent since 2004, the date of the last ad limina visit. Eijk told Vatican Radio that government estimates put the total at only 16 per cent, dropping to 10 per cent by 2020.